Composer. Nationality: Polish. Born: Franz Wachsmann in Königshütte, Germany (now Chorzow, Poland), 24 December 1906. Education: Studied at the Dresden Music Academy and the Berlin Conservatory. Career: Piano player in cafes, and with the Weintraub Syncopaters group; 1930—arranged and conducted Hollaender's score for Der blaue Engel ; 1933—original score for Lang's Liliom ; 1934–35—lived in Paris; 1935–36—worked for Paramount, then for MGM, 1936–43, Warner Bros., 1943–48, then freelance; 1947—founding director, Los Angeles Musical Festival; conducted widely in the US and Europe. Awards: Academy Awards for Sunset Boulevard , 1950 and A Place in the Sun , 1951. Died: In Los Angeles, California, 24 February 1967. Hollywood Quarterly , Winter 1950. Soundtrack! (Hollywood), vol. 6, no. 21, March 1987. Films in Review (New York), August-September 1968.
International Film Collector , May 1973. Frankenstein, Alfred, in Film Music Notebook (Calabasas, California), Spring 1975. Ecran Fantastique (Paris), no. 6, 1978. Rivista del Cinematografo (Rome), April 1982. Soundtrack! (Hollywood), vol. 5, no. 19, September 1986. Waxman, John, in Films in Review (New York), September-October 1991. Larson, R.D., "Franz Waxman (1907–1967): Two Unrecorded Scores from 1936: 'Fury' and 'Devil Doll'," Film Score Monthly (Los Angeles), no. 39, November 1993. Handzo, Stephen, "The Golden Age of Film Music," in Cineaste (New York), Winter-Spring 1995. Smith, Jack, "The Soundtrack," in Films in Review (New York), September-October 1996. Part of the ironic benefit bestowed on the American film industry by the Nazi regime, Franz Waxman was the most prominent of the German musicians who advanced the craft of film scoring in Hollywood. Aside from his distinguished work in films, Waxman was a fine conductor, and invested much of his time in creating and guiding the Los Angeles Music Festival, which began in 1947 and lasted until his death 20 years later. He won Oscars for Sunset Boulevard and A Place in the Sun , and he was the only composer to set the style for a whole genre; his first dramatic score in Hollywood, The Bride of Frankenstein (1935), written for Universal, was subsequently used, either in pieces or in imitation, for dozens of horror movies made by that studio in the following decade. Waxman began piano studies at six but was not encouraged by his businessman father to pursue music as a career. At the age of 16 he began work as a bank teller in his hometown of Königshütte, but within a year he made the decision to enroll in the Dresden Music Academy. In 1923 Waxman went to Berlin to study composition and conducting at the conservatory and supported himself by playing the piano in night clubs and cafes. He was hired by the Weintraub Syncopaters, then a popular jazz band, and began making arrangements in addition to playing the piano. He was befriended by the composer Frederick Hollaender (also an emigré to Hollywood during the Nazi period), who persuaded the producer Erich Pommer at UFA to engage Waxman as an arranger in 1930. One of his first assignments was arranging Hollaender's songs for The Blue Angel , the success of which assured Waxman continuous work. In 1933 Fritz Lang gave him his first job writing an original dramatic score, Liliom , filmed in Paris. 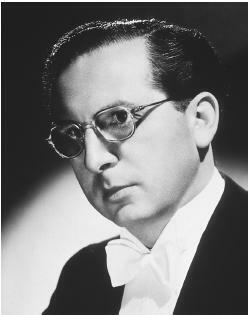 Because of the adverse political climate in Berlin, Waxman decided to stay there, but after only one assignment he was called to Hollywood by Pommer, who was filming Jerome Kern's Music in the Air , to be the music director. It resulted in a two-year contract from Universal, followed by terms with MGM and Warners. In addition to his two Oscars, Waxman was nominated for The Young in Heart , Dr. Jekyll and Mr. Hyde , Objective , Burma! , Humoresque , The Silver Chalice , The Nun's Story , and Taras Bulba. Very much a serious composer, he felt deeply about the value of film as an outlet for contemporary composers and resented the disregard of most American music critics toward the medium. "There are still too many who look down their noses at anything written for films. This is a very silly attitude, and it does not exist in Europe, where critics have not condemned composers because they write for the screen."